You’re chance to win a great prize package from Swix, Orange Mud, Drymax, Gu, and Buff. You’re chance to win a great prize package from SCARPA, Outdoor Research, Ibex, Balega, and more. You’re chance to win a great prize package from New Balance, Nathan, Stance, UnTapped, and BUFF. You’re chance to win a great prize package from La Sportiva, Hoka One One, Black Diamond, Smartwool, and Honey Stinger. You’re chance to win a great prize package from Altra, UltrAspire, Injinji, VFuel, and BUFF. 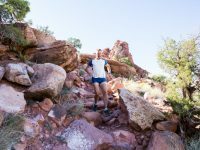 A guide to running downhill on trails. You’re chance to win a great prize package from The North Face, Ultimate Direction, GU, and Drymax. You’re chance to win a great prize package from Salomon, Suunto, Julbo, CLIF, and Drymax. 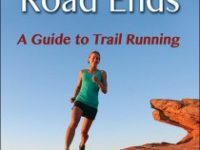 A week celebrating the launch of Where the Road Ends: A Guide to Trail Running published by iRunFar’s Meghan Hicks and Bryon Powell. An excerpt from the book ‘Where the Road Ends: A Guide to Trail Running’ by Meghan M. Hicks and Bryon Powell.